Nov. 15, 2017 3:30 p.m.
A wolf leads the pack as a parade of lighted boats sets sail on the shores off Oak Bay. 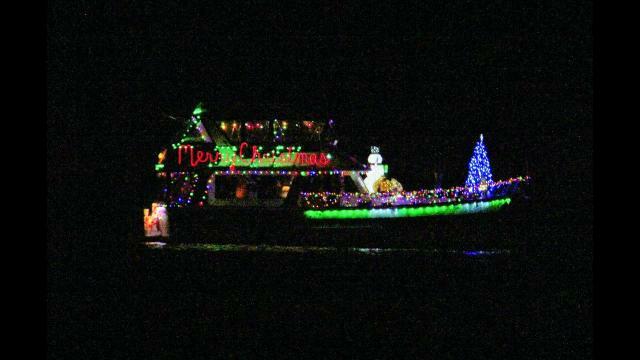 HMCS Wolf, an orca class patrol vessel, heads up the annual Sea of Lights Dec. 1. “Last year we had (HMCS) Caribou and they did a great job of lighting the ship, so the navy will again lead the way,” says Andrew McBride, organizer of the Royal Victoria Yacht Club’s Sea of Lights. Erik Bentzon plans to deck the hull of his vessel Aquavit as the judges boat – including the RVYC Commodore Gordon Wilkinson and Oak Bay Mayor Nils Jensen alongside other dignitaries. Aquavit and Wolf will be among an expected 20 vessels decked out for the event, including at least one paddle board. RVYC provides two nights moorage for visiting vessels looking to take part in the free parade. They also host a dinner with prizes for all entrants courtesy Oak Bay, Cadboro Bay and regional marine businesses. “We want to have fun out there and we hope to make it so all the people who come to view it have fun as well,” McBride said. The lit boats parade by Cattle Point, Willows Beach and Gyro Park between 7 and 9 p.m. The annual event draws roughly 2,000 residents to the two community parties at Willows in Oak Bay and Gyro in Saanich. In Oak Bay, the fire department mans a bonfire and the Kiwanis Club of Oak Bay dishes out hot chocolate by donation to the club. At Gyro, the Salvation Army benefits as the 12th Garry Oak Scouts dole out the cocoa. Along with all the organizing, McBride will also configure 11 stars and roughly 3,000 lights to his own boat again this year. “I have a lot of fun. And I have so many Christmas lights I have to do something with them,” he says.